I like a matte finish as it hides my limited painting skills somewhat (rattle cans) and the pin wash smooths over my shoddy masking. Anyway, I like it regardless. 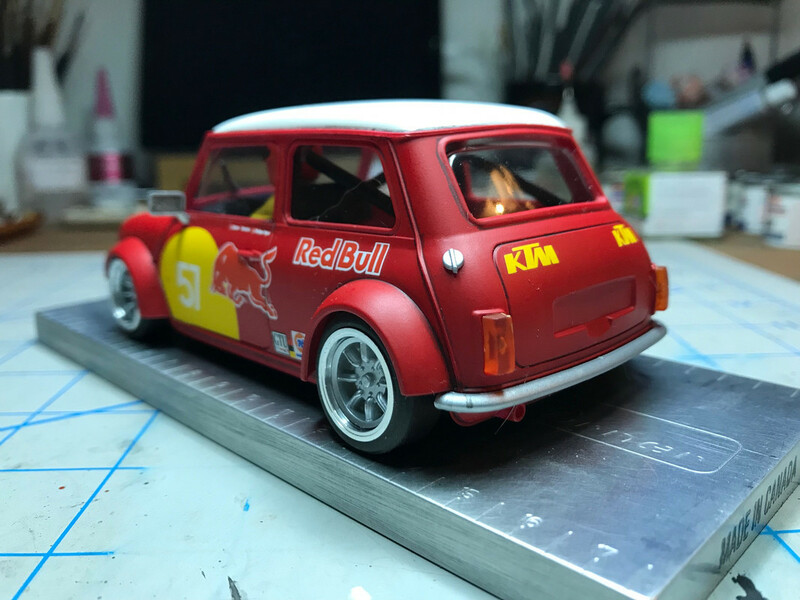 PG tires on the back because no one makes silicone tires for it yet and I used some leftover 1/32 DMC Porsche decals. Getting the interior is was a struggle - kind of like a ship in a bottle kit - but we eventually succeeded. Last edited by Tangmere222; 02-17-2019, 10:15 PM. Hey, that looks pretty good even with dog hairs! Very cool. I tried getting one. The White Kit Mini's were delayed. We just landed a few that will fulfill all our Back Orders. We will be getting more as soon as BRM can produce them, and pack and ship out to us. More are coming soon as are the spares!!! Than Flat paint looks great really like your build!!! image_48140.jpg Able to post images now. 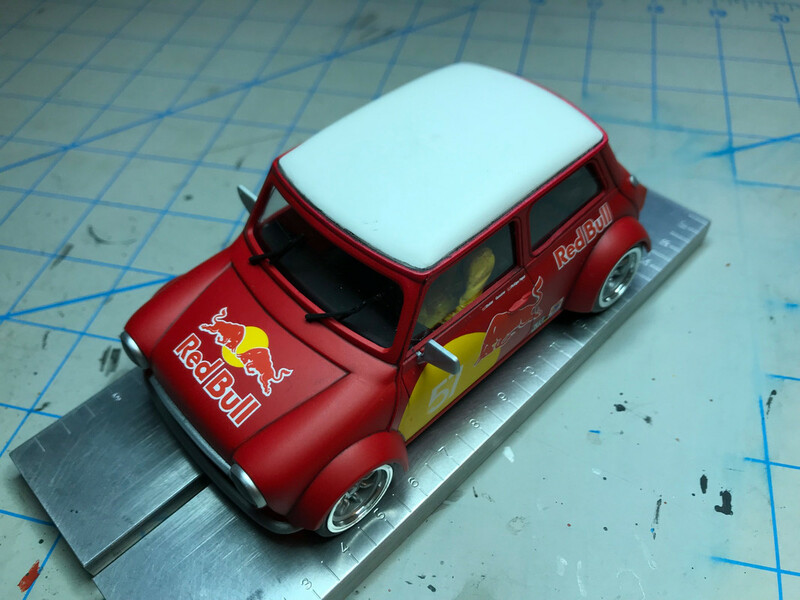 Last edited by Scaleracing; 03-12-2019, 09:23 PM. 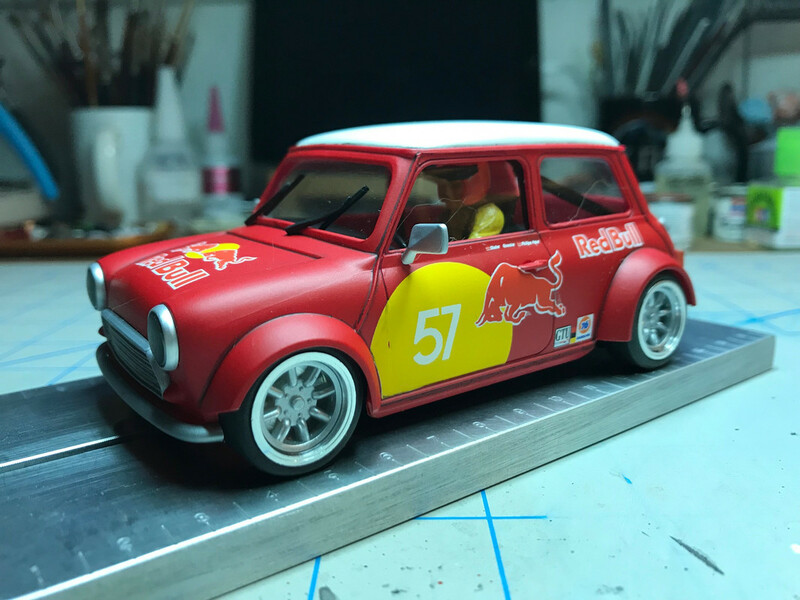 OK not a Mini but was excited I could do this. Loaded from my phone, SCI is getting better. Now home for a little shut eye. That looks great!! Good job! Looks a lot better than my first car. The most important thing, is finishing the project. I like the matte finish, it hit me at first because its not expected, but in the end, I like this car. You doing a whole field? NEXT!